If you are looking for information on the Panchero's Mexican Grill franchise business opportunity, Panchero's Mexican Grill franchises or Panchero's Mexican Grill franchising, then you have come to the right place. 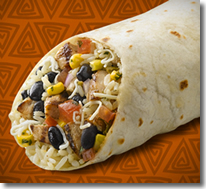 What is the Panchero's Mexican Grill Franchise Opportunity? Panchero's Mexican Grill offers its customers great tasting, freshly prepared, quality "Fresh Mex" cuisine served in a fast casual format. FRESHLY-PRESSED TORTILLAS made to order and made from scratch daily. Fresh, high quality ingredients served in large portions to create a superior product. A "Deli-style" service designed to involve the customer in the preparation of their "customized" meal. A display cooking line that emphasizes the freshness of all menu items. A high-energy "warm industrial" restaurant décor and branding program. A proven restaurant concept with over 15 years of operational success. A Simple Story, Simply Fantastic "Fresh-Mex"
Rodney L. Anderson and his father founded the Panchero's concept back in 1992. Their original two restaurants were opened in Iowa City, Iowa, near the University of Iowa campus and East Lansing, Michigan, near the Michigan State University campus. It appeared as though huge burritos and hungry students were a perfect match and created a "cult-like" following. In 1998, Panchero's took its biggest step and started serving homemade tortillas that are pressed fresh and made with every order. The response was immediate and powerful! 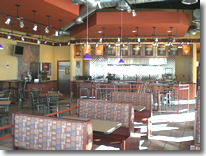 In 2000, Panchero's graduated from the college campus and took its concept to the suburbs. Today, Panchero's is serving its homemade tortillas, filled with the freshest ingredients across the country. If there isn't a Panchero's nearby now, there will be soon! Franchise Support Second to None! The identification of the right location for your restaurant can't be overstated. Panchero's provides you with real estate assistance throughout the process, starting the day you sign an agreement through the final negotiations of your lease. All site specifications have been identified to provide for the best opportunity for success and our staff work with all parties involved to ensure that all standards are upheld and the best circumstance is being provided to you. You will be supported with a talented and dedicated design team providing you with specifications that ensure facility efficiency and customer convenience. Our design and construction management staff will assist you in all aspects of restaurant development, including equipment specifications, vendor sources, signage, remodel enhancement programs and will consult with your local architect to ensure both quality and consistency. Your team will receive comprehensive training in Panchero's financial controls, personnel management, operating procedures and all other aspects of business operation. You and all others involved in the restaurant management will participate in "on-the-job" training at a certified restaurant prior to the opening of your business. 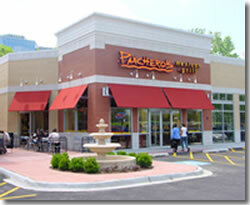 You will receive Panchero's assistance in planning marketing activities to support the growth of your restaurant. Beginning with the Grand Opening, you will have access to radio, television and print advertisements designed to strengthen Panchero's name recognition and attract customers to your location. You will appreciate the ongoing business support provided by Panchero's restaurant operations experts, who will direct owners in all business disciplines, including quality control that is so crucial to customer and owner satisfaction.